4/1/2006 – In the past years our web site has published a series of elaborate April Fool's stories. Not this year, and not any more. An international watchdog group which calls itself League for Truth and Veracity, is threatening news services as well as private pranksters all over the world with lawsuits for publishing false information. This unfortunate activity spells the end of an old tradition. The April Fool tradition has it roots in ancient Rome, where playing practical jokes on friends was part of the celebrations of Hilaria (March 25). It evolved into the current-day April 1st practice in 18th century Europe. In England you were supposed to play your pranks during the first half of the day. The Scots reserved 48 hours for it. In France the tradition is known as "April Fish", in Spanish the "dia de los Santos Inocentes". The tradition came to America with early Scottish, English, and French settlers, where it was mainly about sending people on fool's errands. On our news pages we have carried on this tradition, always publishing, punctually on April 1st of each year, a fabricated story intended to entertain our readers. A list of the stories can be found below. However, in this year we have been forced to abandon this practice, having received legal threats from a watchdog group calling itself "League for Truth and Veracity" (LT&V) in case we continue to "wilfully and knowingly publish false information that is aimed at maliciously misleading readers and visitors to the ChessBase news portal." The group, based in Harrisburg, Pennsylvania, has offices in Georgia, Kansas, New York, London, Paris, Frankfurt and Moscow, objects to the "pagan origins of the April Fool ritual". The plan of action appears to be to bring lawsuits against big news outlets, while sending cease-and-desist letters to private individuals who engage in practice by post, email or in some cases even verbally. The cease-and-desist letters require the recipient to remit a legal fee of $35.50 for clerical expenses incurred by LT&V. Although civil liberties and free speech groups believe that the threatened legal action would have little chance of success, many people will comply with the letters and remit the amount, rather than risk a potentially expensive lawsuit. In the case of a big news portal like www.chessbase.com the sums involved are much higher. The prospect of extended litigation with LT&V has led us to abandon our traditional April 1st practice. We warn you that the above story (letter, message) may contain false or spurious information, fabricated under the pagan tradition of the "April Fool's" joke. It must not be taken seriously. We apologise for any inconvenience this story (letter, message) may cause to the reader. We have decided against publishing a fabricated story with the above disclaimer, but advise our readers to use it in case they are intending to perpetrate an April Fool's joke. Just copy and paste the text into your April Fool's message. If you have already sent out such a message it is advisable to send a second message to the same person, quoting the original message with the disclaimer added ("We warn you that our previous message...). So no more jokes without the mandatory disclaimer. LT&V informs us, however, that "meta-pranks" are allowed without the disclaimer. But we are not sure what "meta-pranks" could mean. We warn our readers that the stories listed may contain false or spurious information, fabricated under the pagan tradition of the "April Fool's" joke. We apologise for any inconvenience this may have caused. After the Blindfold and Rapid tournaments in Monaco, on April 1st 2005 the Kriegspiel section started. The main point about this variant of chess is that players only get to see their own pieces, not those of their opponents. They also do not know what moves the other side has made, so they have to guess where the opponent's pieces are. Only the referee knows exactly the real position of both sets of pieces. 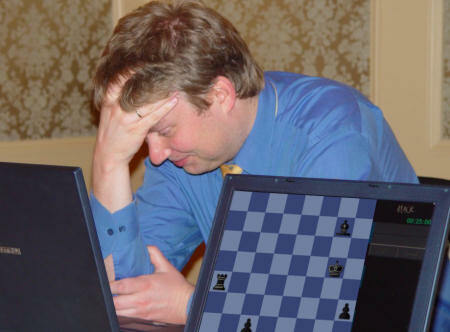 GM Evgeny Bareev started with a stunning 2-0 victory over Vishy Anand. How the prank was perpetrated. On April 1st 2004 we announced that a new chess program named Kimo was due for release. It worked with chess knowledge derived from 20,000 master games, which had been extensively analysed by the program, which drew heuristic conclusions on the principles of chess: the value of the pieces in different positions, their strengths and weaknesses, attacking and defensive motifs, etc. Although it examined just two positions per second (as opposed to millions in a traditional brute force search) it was able to hold its own against the world's strongest programs. The story was modified in the article Kimo – the full truth. On April 1st 2003 we reported that the Brutus FPGA hardware project that ChessBase was engaged in had been taken up by the US National Science Foundation and other US defence agencies who had been working on a project to interface the brain directly with computer equipment. The scientists working on the project decided that the hippocampus, a portion of the temporal lobe, was the ideal location for a "bionic interface". There was a vigorous recation from our readers ('Please don't touch my hippothingy!'). On April 1st 2002 we reported that the reclusive ex-world champion Bobby Fischer has introduced a number of important innovations into the game. After the Fischer Clock and Fischer Random Chess he is now proposing a further change, the "Fischer move". It was presented to FIDE and will come up for a vote at the Executive Council meeting in Dubai. Reactions.